Wildlife Aid had been alerted to a couple of cases of foxes stuck in gin traps (illegal in the UK since 1958), resulting in the death of two animals in Guildford, Surrey. 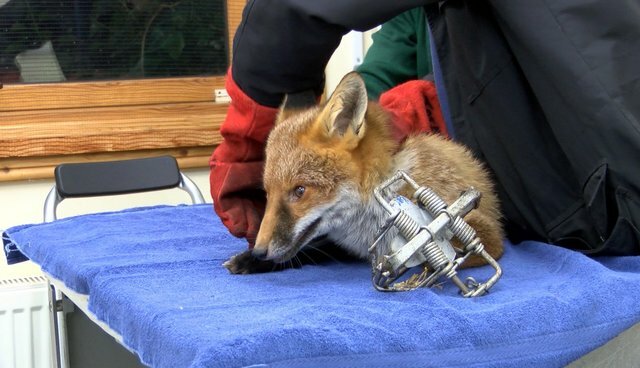 In this video, Simon, Sean and Lucy were called to rescue the first victim, a fox with the trap clamped on his front leg. Even though he was injured and limping badly, the fox was very feisty and severely bit Sean's hand! Sadly, it is just not possible to amputate a front leg of a wild fox. The fox would die a long slow death in the wild without a front leg (no ability to pounce on prey, dig, climb etc). We can and would amputate a hind leg if we had to, but never a front leg. £1,000 reward for information leading to the successful conviction of the individual or individuals responsible for setting the illegal gin traps. (See press release) If you ever see one of these traps, please call the police or your local Wildlife Centre. If you would like to help us fight the use of these horrific animal traps, please donate via our website.